(Image: Screen capture from Alec Steele video on YouTube – picture is linked to the original. In the image, Alec Steele is showing Mike Boyd a better angle for striking the hot steel while forging a leaf. This is the 8th in a long series of posts that will teach and explain The 6 Perspectives of Leadership™. Find the other parts to this series HERE. Share this with your colleagues on LinkedIn. Print it out and use it in your workplace. Provide the tools to do the job. Provide the training and knowledge to do the job. Meet the needs of individual performers so that all can be set up for success. This part will go deeply into one particularly critical skill – the ability to TRAIN others effectively. Do a google search for “training model” or “training method” and you’ll find countless processes for training others. Many are very good. I particularly like the model that the Boy Scouts of America uses called the EDGE Method. The training process I’ll be sharing with you in this article is modeled after The 6 Perspectives of Leadership™. Let’s look at the 6 Perspectives and it’s relative training process. In the table below, you’ll see the parallel. Explain the Vision of what is to be learned. Explain the Strategy for execution. Enable the trainee by providing the tools, knowledge and access necessary. Support your trainee as you watch them try the new skill. Offer feedback and correction until the skilled is learned. Protect the trainee by checking in on developing progress. Offer correction and redirection when necessary for further mastery. Empower the trainee to take ownership and leadership in this skill. Encourage them to lead and train others in they skill when they have achieved mastery or advanced ability. Admittedly, this is an exhaustively detailed training model. But that’s on purpose. It’s not just about teaching a skill; it’s about teaching a skill in such a way that you create excellence, buy-in, intrinsic motivation, and other leaders who can share the trained knowledge and skill. It’s robust so that you, as a leader, can create greater ROI than the average training model. Alec Steele (here’s his twitter profile) is an English blacksmith who showcases his work and methods on YouTube. (Here’s his channel.) Alec has a series of three videos in which he trains Mike Boyd (Twitter YouTube), another YouTuber, to forge and hammer a blade. In the first video, Alec teaches Mike the basics and walks him through the process of forging a knife. In the second, they set up and get ready to forge a second knife. In the third, Mike forges a second knife, utilizing the skills he’s learned. At the end of the third, Alec sends Mike on his way with a newly learned and proven skill. Step 1 – Vision – First Video – At the 0:40 point, Alec explains that in learning how to forge a knife, he will have to learn the skills that make up the whole process of forging. 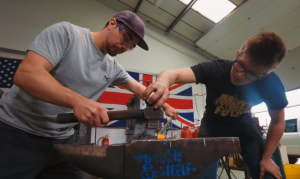 “This is to get an understanding of how to swing the hammer, start getting more comfortable in the fire and in the forge, and dealing with the hot metal.” Alec states more before and after this, but this statement demonstrates Alec providing vision. Step 2 – Strategy – First Video – Also at the 0:40 point, Alec explains that Mike will forge a leaf out of the end of a bar of steel. This will give him the opportunity to swing the hammer and work with the forge and hot metal. Step 4 – Support – This is where the trainer, in this case Alec, let’s the trainee, in this case Mike, execute the new skill on their own. In the second and third videos, Mike goes on his own to make a second blade, a Scottish blade called a Sgian Dubh (skee-an doo). Mike does most of this on his own with just the occasional moment where he seeks feedback from Alec, or when there happens to be a need for Alec to take on a more advanced or newer technique. Again – this is real-time support of getting the job done. Step 5 – Protect – In this step of training, the trainer keeps tabs on the trainee and redirects the trainee for better results and further development. A great example of this is when Alec teaches Mike about a more nuanced skill where by filing a radius where the tang meets the blade results in a stronger tang-to-blade transition. It was redirection, which protected Mike from making a weak tang-to-blade transition. Step 6 – Empower – At the end of the three videos, Alec declares to Mike that he has learned what he needs to go forward and continue forging blades on his own. He may not have reached a level of mastery yet, which the 6 Perspectives model advocates, but Alec’s statement is that Mike is ready to go on his own. He has been empowered after all the other steps of training have occurred. As an organizational leader, your responsibility is to ensure that you have a culture that values and utilizes a strong training process at all levels. The 6 Perspectives Training Process builds capable, empowered people who can spread the knowledge. It’s your responsibility to execute the training process. The biggest mistake you could make is in skipping a step. Every step has a unique purpose, and by following all six steps, you create a workforce that excels with mastery in their work. When you skip a step, it might still go well, but you’ve left the door open for something to go wrong. Believe it or not, you can train yourself. This is a matter of following the six steps of the 6 Perspectives Training Process and seeking out the resources to fulfill each step. Alec Steele is currently in the process of teaching himself to engrave steel and inlay gold. Step 6 – And when he finishes, he will be empowered to continue. Let me reiterate – this is a robust process at 6 steps. Each step could conceivably have several sub-steps. I encourage you to utilize a list of the steps to remember them all. But why go through all this effort? Because… Training is about setting your people up for success from the beginning so that they can produce their very best. This may be the most important thing a leader does on a day to day basis. First Video – Alec starts the training process with Mike. Second Video – Alec continues the training process with Mike. Third Video – Alec concludes the training process with Mike. This was Part 8 in a multi-part series that will teach and explain The 6 Perspectives of Accountable Leadership™. Follow me to catch the upcoming posts where I explain in greater details what it means to build a foundation and lead from each of the perspectives. Look for upcoming posts on Mondays. Follow my business page, Derek Rey Consulting, LLC to find all of the 6 Perspectives blog posts archived. Follow me on Medium to see more of my writing. Feel free to share with others whom you believe would benefit from these teachings.